Imagine a situation where you have a pretty long passage that you are bored to read and rather hear it on your PC/laptop. One of the reasons why audio books are popular today is instead of reading you can hear what the book says. And you can compile your own audio book with the help of Notepad. Yes, you can do it easily with this really cool Notepad trick. STEP 3: Now save the code that you have entered above. The code has to be saved in .vbs format rather than standard .txt format. You can name the Sound.vbs or any other name that you desire and save it on your desktop so you can easily access it. STEP 4: Now, visit the location where you saved the converter (desktop in this case) and look for your saved file. You’ll see that your Notepad program is automatically converted into a Visual Basic Script File (VBS File). Now go to the large passage that you want to hear on your PC. 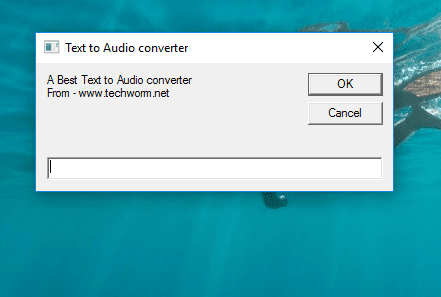 Select the entire passage and copy it using CTRL + C. Go to the audio to text converter you have saved on your desktop and paste the entire passage using CTRL-V and press OK. Listen to your PC/laptop belt out the entire passage without a hitch while you can continue using your hands to do other work. Hope you liked this tutorial. Do come back to Techworm for more such awesome tutorials. Who Ever and Bernardo, The same has been corrected. Kindly try it out now. tell me how to, ty if youll respond to this correctly i needed to know/. Hello all, the error is from an “invalid character” which is due to the double quotes being used. When you copy and paste from this site, it is using a different set of ASCII quotes than the standard double quotes. Replace all of the double quotes in the code by deleting them and retyping them from your keyboard. This will insert the correct ASCII code for the standard double quotes. Cheers! Fixed the issue. Just retype the inverted commas. The inverted comma you see on this website is not the actual inverted comma used in VBScript. this is not working I tried 20times.. It works but it can only convert text of 45 words maximum to audio. Kindly refer to the comments for solution.